In the latter years of the Qing Dynasty (during the reign of the Emperor Guangxu), there lived in the Changchun area of Jilin province, northeast China, a man named Wang Mengxing (王梦醒). One day his mother died of illness and was buried in Changchun. Wang Mengxing entered the famous (Daoist) temple on Mount Qian (千山 – Qian Shan) named ‘No Limit Temple’ (无量观 – Wu Liang Guan) where he dedicated himself to the study of the Dao (道). However, for the last ten years of his life, he lived in a simple hut next to the tomb of his mother, where, for three years he observed the Confucian ritual of filial mourning. This involved him drinking only cold water, and eating raw rice (in the form of uncooked rice flour) to fill his belly. After hearing rumours amongst the people that there was a Daoist priest sat in constant meditation by the grave of his mother – the local battalion commander named Cao Kun (曹锟) – travelled to the Changchun area to see for himself. When he arrived at the site of the tomb, Cao Kun found Wang Mengxing sat in quiet and still meditation. As his fame grew, many ordinary people brought offerings of money to help Wang Mengxing – but he remained unresponsive to the attention and indifferent to the offerings of money (much of which blew away in the wind). Quite often a pile of coins would build-up around his seated area and as he did not move, poor people would come by and simply take the money for themselves – assuming that Wang Mengxing was wealthy and did not care. However, one day a robber armed with a knife came to Wang Mengxing and demanded the money and riches he thought that he possessed – but could find none. Before leaving the area, the robber stabbed Wang Mengxing in the throat. The next day the police arrived to investigate and found Wang Mengxing unable to talk due to his badly injured throat. As Changchun was very busy at the time with many visitors from other counties, the police asked Wang Mengxing if a stranger had attacked him, but he denied this with a shake of his head. The police asked if what happened had originated from the ‘divine-sky’ (天 – Tian), to which Wang Mengxing nodded yes to this idea and the police stated that in that case, they cannot arrest a ‘spirit’ and demand a life for a life. Shortly after this incident in 1934, Wang Mengxing died (whilst sat up in meditation). 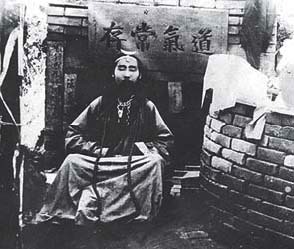 The local people placed his body (still sat crossed-legged in meditation) in his mother’s tomb and called the area the ‘Filial Son Grave’ (孝子坟 – Xiao Zi Fen). There are many stories about Wang Mengxing who taught his disciples that filial piety should be a corner-stone of correct spiritual training. During the Japanese occupation of northeast China (and the establishment of the Manchukuo puppet State), Changchun was declared the capital city and a large road was planned. However, the ‘Filial Son’s Tomb’ was in the way and workers were sent to clear the obstacle. Every worker who tried to damage the grave either fell injured or fainted. The Japanese did not believe this and used artillery shells and aerial bombardment on the grave – but to no avail as all the missiles failed to explode. The Japanese also made the puppet emperor Xuantong (宣统) – also known as ‘Pu Yi’ – to issue an imperial edict to move the grave – but no one was able to carry-out the order. Not long after this, a voice was heard emanating from the tomb stating: ‘I have been sat on my meditation cushion for many years now (both alive and dead), and have practised self-cultivation that preserves the body by building the essence (性 – Xing). This is how I have observed (and integrated with) the true essence (真元 – Zhen Yuan). I watch over this grave in the name of the divine-sky and I can tell you that it is not time for the bones of my mother to migrate.’ Everyone living in northeast China has heard of this ‘Filial Son Grave’ and many thousands of people go there every year to burn incense and pray – some even spend the night in the old Daoist Temple nearby.